One thing Audé has really got involved in is helping the new generation of people jump on the scene – kids that perhaps haven’t gone to engineering school or learned the correct ways to make music. “They might not know the notes in a C chord, or the difference between major and minor keys, but they have computers, so they are able to make music, because technology allows them to, and that’s a great thing,” he insists. “Waves [Audio] has been smart and realised that there’s this big, giant generation of people out there doing this, who aren’t necessarily miking drum kits or guitar amps, or using big consoles to do stuff. “It’s not about catering to the likes of Tony Maserati or Manny Marroquin, who are of course the top of the top; Waves has made great, easy-to-use plugins, which use simple terms like bass, treble, and compression – OK, a lot of kids don’t know what compression is, but that can change – and I am helping get the word out there, basically. Audé never copies and pastes material from his Pro Tools sessions; every project is done from scratch. “It would be boring if I just changed the key and a few notes – which a lot of guys do, I should add! I have to love it, and I wouldn’t love it if I did it like that,” he laughs. “I think: ‘What’s hot right now?’ and whether I want to do a house mix, a progressive mix, or an EDM, whatever the hell that means! I’ll get my vocals, put everything at 128 [bpm] - sometimes it’s 130, sometimes it’s 125, and sometimes the vocal is really slow, so you can’t go higher than 125. Audé has a big rack of gear’; however, it’s pretty redundant these days, as everything is done in the box. Over the years, he has developed a kit of sounds using pretty much every drum machine known to man. “I’ve got an 808, a 909, a 727, a 707, an OB drum, a Linn Drum; I sample all those to death. My go-to synth is the reFX Nexus, which is a super, easy-to-use synth with a million sounds, all of which are pretty great; I do my writing with that,” he explains. “If I need deeper bass, maybe I’ll pull up the Ace synth, or the Massive, to replace the bass; and then I check my pads. These days, the go-to pad is the Spectrasonics Omnisphere pad, which has basically replaced all my Roland synths. “In terms of plugins, I love to use the Waves stuff. I genuinely can’t say enough about Waves, period. 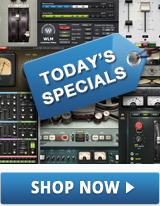 My favourite plugins today would be the Jack Joseph Puig and Tony Maserati Signature Series, and the Chris Lord-Alge stuff, all of which are great for guitars and vocals. According to Audé, if you don’t have to leave the box, you can work quicker and faster; and what’s great about modern technology is the ability to get your ideas down right away. To be a success in this game, you have to commit, Audé insists – and more important still, you have to love what you do. “When I first started producing and remixing, I didn’t even think of the money, I just adored doing it; if you love doing something enough, the world will figure a way out to let you do that,” he says, profoundly. “To be a great DJ, you can’t just listen to great records, you need to listen to thousands of records and get some kind of knowledge; to be a great remixer, you need to go out and do 100 different remixes: different styles, tempos, and gain as much experience as you can. WHAT’S ON THE MASTER FADER? Audé has some interesting stuff going on in his master fader chain, which begins with an Izotope Ozone 5, which he uses primarily for colouring. From there, he goes into a de-esser – “to get rid of a little sibilance around 13k, which no one does” – in order to get a little more level. Then, it’s into a Waves MV2 plugin for more level. Then it gets a little crazy... He comes analogue out of Pro Tools, into a couple of Distressors (EL4s) at a ratio of 3-1 with medium attack and release, “to smash up the mix”; and finally, he’s back into Pro Tools, into an L3 for more level, pumping the Pro Tools master channel about 6dB, using internal Pro Tools channel distortion for even more level... Simple, eh?